Summary: Kenny Wright is a kid with a secret identity. In his mind, he's Stainlezz Steel, super-powered defender of the weak. In reality, he's a chess club devotee known as a "Grandma's Boy," a label that makes him an easy target for bullies. Kenny wants to bring a little more Steel to the real world, but the question is: can he recognize his own true strength before peer pressure forces him to make the worst choice of his life? When PUBLIC SCHOOL SUPERHERO by James Patterson and Chris Tebbetts arrived at our house, there was one very excited 10 year old! Booking Son is a relatively reluctant reader, but he's found so many James Patterson books that he's enjoyed. He was excited to see that there is a new one out... and that he got an "early" copy! PUBLIC SCHOOL SUPERHERO tells the story of Kenny Wright, otherwise known as the superhero Stainlezz Steel... but only in his mind! He actually plays chess and is called "Grandma's Boy;" and as you can probably tell by his nickname, he's often times the victim of school bullies. He attends a public, inner city middle school that's definitely seen its better days. Kenny finds himself in a little trouble and his "punishment" is to teach one of the bullies chess. Naturally Kenny is less than thrilled with his circumstances, but he finds that he's not the only one learning something! I really liked PUBLIC SCHOOL SUPERHERO and I suspect middle grade readers are going to agree... even/especially the most reluctant ones! PUBLIC SCHOOL SUPERHERO is a fast-paced (and funny!) story that is guaranteed to keep kids' interest. In addition, there is enough comic panels thrown in to break up the reading. It also doesn't hurt that many of these cartoons have superhero sequences! PUBLIC SCHOOL SUPERHERO explores so many middle school issues, and I think kids are going to find a few things to which they can relate. Kenny attends an inner city school that is just horrible, and I'm pretty certain it's not an unrealistic portrayal -- I honestly have no idea how any kids can learn in that environment. As depressing as it is, it's actually refreshing to see a school portrayed like this, and I hope that many kids will relate to Kenny and see that they aren't alone. Another wonderful aspect of this novel is the way it explores bullying. I know! I know! There definitely isn't a shortage of middle grade books dealing with this subject; however, I liked how PUBLIC SCHOOL SUPERHERO portrayed this. Not only did Kenny work through his relationship with one of his bullies, but he also managed to learn a thing or two from him. As a mom, I loved how this novel explored friendships and relationships. Kenny lived with his grandmother (who was a fantastic character and community advocate! ), and they had a wonderful relationship. Kenny loved his grandmother and knew she loved him; and as a result, he didn't want to let her down... there was also a little fear there too! Kenny also had a neat relationship with some of the kids in his school and neighborhood. Overall, I think PUBLIC SCHOOL SUPERHEROES is a great middle grade book that's guaranteed to entertain kids! It also deals with so many relevant subjects that it lends itself to classroom and book club discussions. High recommended! 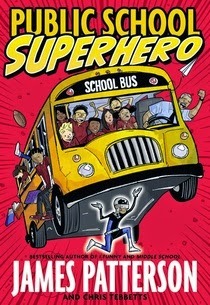 If you still want more information about PUBLIC SCHOOL SUPERHERO, you can learn more at Public School Superhero.com. 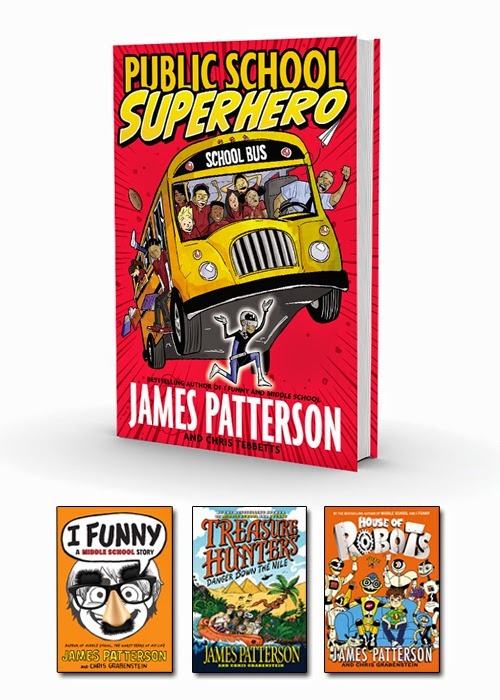 You can also visit the Author Site at JamesPatterson.com and follow him on Twitter and Facebook (#PublicSchoolSuperhero). To enter, just fill out the form below before March 30th at 11:59 p.m. EST. I will randomly select and notify the winner the following day. This contest is open to those of you with U.S. addresses only. Good luck! Thanks to the publisher for providing a review copy of this novel and for providing the James Patterson Reads Prize Pack! I'm all for any book that gets kids excited! Thanks for the giveaway!